We first started in 97, we were four (two guitars) but it was only for our pleasure (& it still), something new to do on the week-end, you see. We've fired the former drummer, and Denis who was playing guitar took his place. An interactive CD that Boni released with tracks of the single + others tracks live, & 5 video-clips + other stuffs on the band. We planned to record another single soon & maybe take part of a LP compilation tributed to French skinhead scene of the 80's. Denis also play (and still) in Criminals in Feast. What is the scene like in France? And how do you perceive the UK scene to be ? There are some differences from the early 80's, first nearly all the scene was in England, today its more worldwide, the skinhead scene seems to be less powerfull or productive than at this time even then it seems that there are more new bands (it ain't the same level...) & on the other side, the scene today seems to be much more organized and in some areas you can see many new bands ! that's can be good. And it contributed to make us play foreign. In France you see there ain't no unity, the scene today is very categorized, you've got sharp, rac, trads, scooterist, ... Organize gigs here always being hard (not only to find a place to, but mainly cause of the trouble & fights in the audience), but it don't seem we have many proposition to play in France, we don't know why maybe only cause of pre-concieved ideas on us. What are the main themes in the lyrics? What is the favourite song (and what band is it by) of each member of the band ? 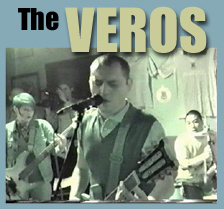 Why did you choose the name The Veros? In fact we didn't really took the time to choose one name, first we didn't supposed to play live so quickly, & when it arrived Denis proposed that one as Véro generally used to book the studio for practise with her name. Now it's too late to change it...never mind. As we already said another single, 2 tracks for a LP compilation. For the gigs, we could play in Holland, & perhaps another time in Belgium. We don't know more for the moment. Keep the faith, and try and see us live, & for the gig promoters :why not invite us to play wherever or whenever you want ?